The Unthank Supper Club: Thinking about winter.. Currently we are experiencing a heatwave here in the UK. I have just harvested my Turks turban squash and my beans have all gone dry to seed now...and yet my tomatoes suddenly no longer require a kitchen window sun bath in order to bloom red, they are going crazy on the vine. It's balmy and barmy...! I am not sure if I should make a pot roast and sort the log pile or get the BBQ fired up...we did that twice last week. I am in culinary confusion. Last month I looked at my Christmas decorations, items I have loved since childhood and collected over the years. I had a thrill of excitement on a chilly day, imagining nips of Port, planning festive menu's and making my home festive and beautiful for Chrimbo (as we call it in my family). I LOVE Christmas. I love Autumn, I love mushroom hunting and watching the leaves turn and fall...bedding in for the winter, getting cosy, baking with my little boy and having good friends over for roasted meat, red wine and maybe a lazy DVD in front of the fire. Simple things. Yusuf and I are trying to plan our winter menu's, it has not been easy with this warm weather. 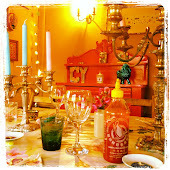 The September Club was an excellent evening with some brilliant newbie Supper Clubbers. It is a joy to meet real foodie enthusiasts out here in the wilderness. I truly enjoy meeting all of our new members and often wish I cooked less so I could chat more. But, I do love cooking. 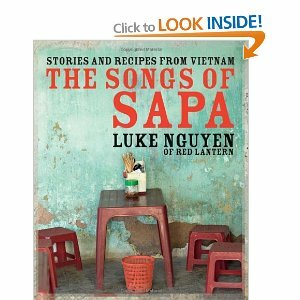 We are a major fan of Vietnamese food and have become more than fans of Luke Nguyen's book 'Songs of Sapa'. It is an exquisite book of not only wonderful recipes, but Luke's journey through family, heritage, history and of course Vietnam. The photography is utterly beautiful and I find myself often drawn back to the book for inspiration. A while back I decided to cook every recipe in the book, for no other reason than pleasure. So far I have cooked about 10 recipes, food I share with my family. The savvy part of me (which is actually not very savvy!) should be sharing this on the blog. I will do my best to try. I made his Cassava cake, which I served with coconut ice cream, pineapple and passion fruit salsa and passion fruit syrup. I wish I had taken a photo, all I can say is it was delicious and I now keep frozen Cassava in my freezer (along with lime leaves and banana leaves) at all times. Damn yummy! Wonderful. You've got a real talent with words. Now I'm looking forward to Christmas too.